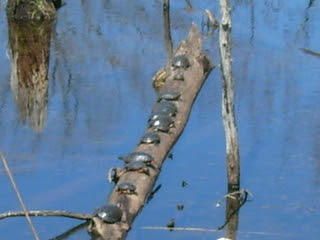 Turtles in a perilous time! Turtles have been on this Earth for well over 200 million years and have even survived through the time of the dinosaurs. Today however, the turtle is facing a grim future. Around 70% of the world's turtle species are now listed on The World Conservation Union's Redlist of threatened species. For some turtles though it is already too late. Several turtle species have already gone extinct. For many people the term endangered species conjures up images of exotic animals far from home. However, the turtles current state of peril can be seen all across the globe. This is both a despairing and unsettling fact as the turtles current state of peril is almost completely due to the actions of people! There are several different factors contributing to the endangerment of the world's turtles. The Blanding's Turtle is a species in decline throughout much of it's range. The biggest issue affecting turtles today is the loss or fragmentation of their natural habitat. Turtles habitats of all kinds are being degraded and destroyed at an alarming rate. Wetlands are drained, forests are destroyed and waterfronts are developed. Turtles are literally losing their homes. The loss of habitat and the increase of human activities and recreation on the water and on beaches also affects turtles and their nests in a negative way. Waterfront developments restrict turtles from prime basking and nesting sites. Containments and sewage run off from such developments can also cause harm to turtles. Pesticides, oils, chemicals, and industrial pollution may contaminate the habitats of turtles and their local prey items. When the turtles eat contaminated prey, they may become poisoned and die. These developments may also cause water levels to rise which can drown nest sites destroying turtle eggs. Recreational activities on the water can also have devastating affects on turtles, such as being killed or severely injured when they are hit by boats or water vehicles. Fishermen will often kill turtles for fear of the turtles preying on game fish. Driving on beaches with cars and four wheelers can destroy nests land in the sand. Pristine turtle habitats are disappearing at an alarming rate. Where good habitat does exist it is often altered by roads and highways. This leads to the death of countless turtles on roads. 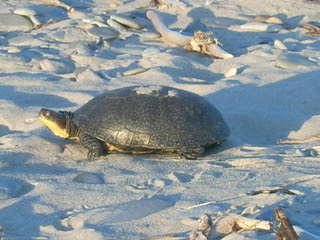 Legions of turtles must cross roads when looking for nest sites to lay their eggs. This is particularly detrimental to turtle populations because not only does it lead to the death of a large portion of the breeding population, the female turtles, but the next generation of turtles is also killed off when the eggs are destroyed. This can lead to local populations of turtle species becoming exterminated . Even if the female turtles do successfully find nesting spots and lay their eggs, the baby turtles only have a 1% chance of reaching maturity. Nests are often destroyed by predators like raccoons and skunks. While human activities have negative effects on turtles, they have helped increased these such turtle predators. The increase in human waste provides an unlimited food source for these predators. This has caused their populations to grow. This surplus of predators takes a very heavy toll on turtle nests. Turtles, including rare and endangered ones, also suffer from being harvested from the wild at an almost unfathomable rate. Turtles and their eggs are collected for the pet trade, food markets or to be used in traditional medicines. Sometimes the turtles and their eggs are captured right off nesting sites. Snapping Turtles are often the victims of direct killings by people. Certain turtles, especially the snapping turtles, are the victims of direct killings by people. Many people believe snapping turtles are dangerous to swimmers and will kill them on site. 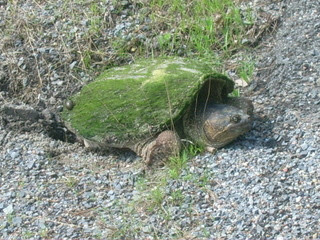 In truth, snapping turtles are not dangerous if left alone. If stepped on underwater the turtle will merely withdraw its head, and if encountered by a swimmer, the turtle will flee the area. Witnesses have observed people shooting turtles for ''sport'' and studies have shown that many times people will purposely hit turtles they encounter on roads. When all the factors above are combined, it accounts for a massive amount of turtles being lost. It is hard to come up with exact figures for each issue because a lot of the time not enough research has been done, and it is even harder to monitor the effects of certain issues like illegal collecting and direct persecution. 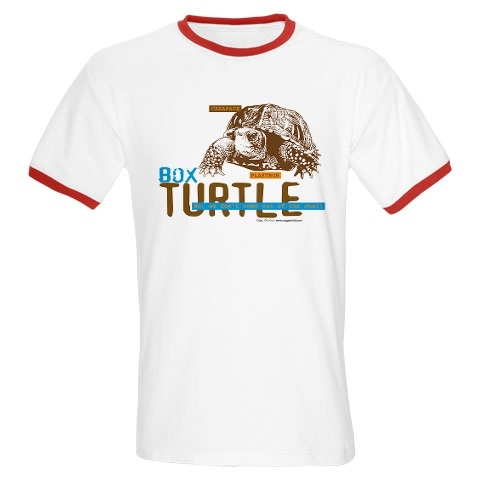 What is known is that turtle species are dwindling and it is largely due to our actions. If we do not take the time to take better care of our natural resources and to reverse our detrimental actions towards turtles, we could lose one of our oldest and successful creatures. If this happens what hope do other species really have?